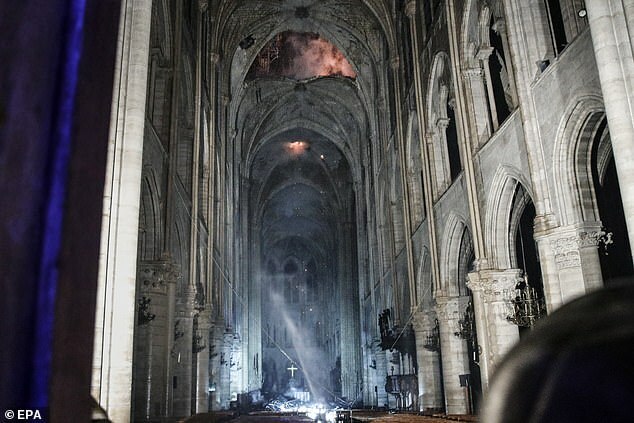 Notre Dame cathedral cannot be rebuilt exactly as it was before the devastating fire ripped through its historic structure because France no longer has trees big enough, experts have warned. 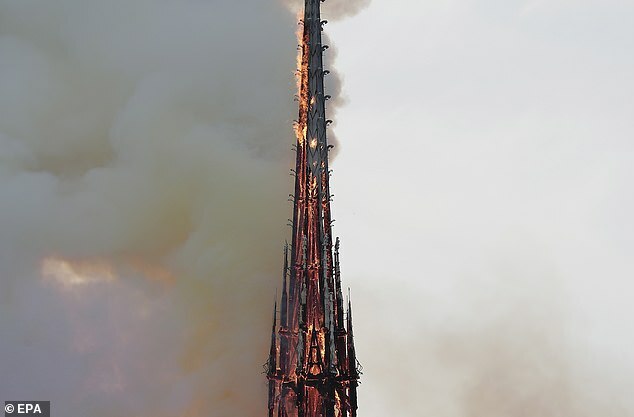 Last night’s blaze erupted in the UNESCO world heritage landmark in the French capital, sending its spire and roof crashing to the ground as flames and clouds of smoke billowed into the sky. 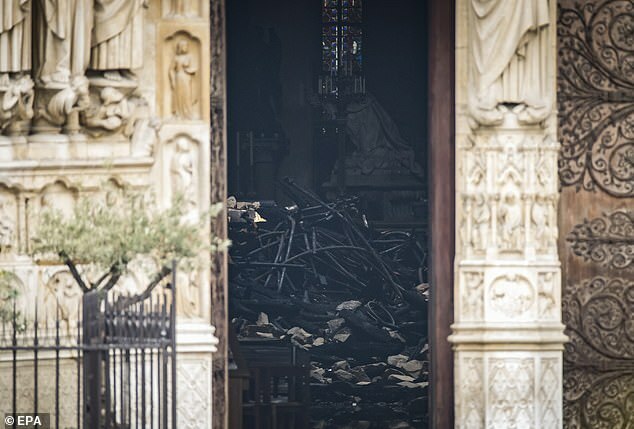 Speaking today, Bertrand de Feydeau, vice president of preservation group Fondation du Patrimoine said the cathedral’s roof cannot be rebuilt exactly as it was before the fire because ‘we don’t, at the moment, have trees on our territory of the size that were cut in the 12th and 13th century’. He told France Info radio that the wooden roof that went up in flames was built with beams more than 850 years ago from primal forests. One factor that could have impeded the growth of the current crop is that so many of the biggest trees in the 12th century were cut down for construction projects. The height of trees is determined by a number of factors, such as competition from its neighbours, environmental conditions, the availability of the right nutrients and also the genetics of the tree. Certain individual trees within a species are likely to have genetics that allow them the grow taller than others. If you remove the largest trees with these genetic predispositions, then only the smaller trees are left to pollinate. Another important issue is the large scale deforestation that took place during this time period. Many trees in the medieval forests of France during the period had been growing since the 7th and 8th centuries – meaning some of the timber in the destroyed frame and roof were as much as 1,300 years old. Such vast amounts of timber were needed in the construction of churches, castles and ships during this period that much of France’s ancient woodland was cleared. This deforestation made the reconstruction of such a unique structure centuries later using similar materials even less likely. 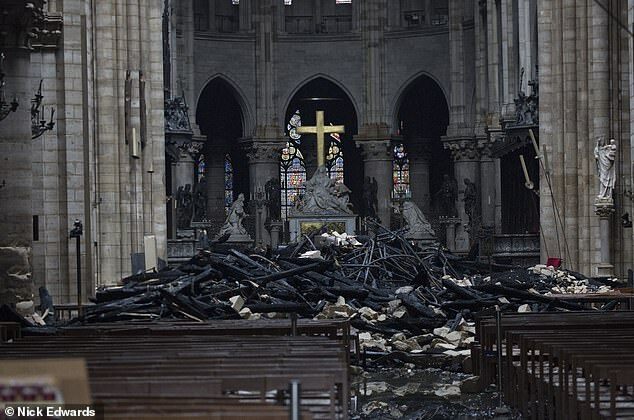 Notre Dame’s official website states that even in the 12th century when the cathedral was being built, the felling of huge swathes of French forests were causing concern during the construction. The entire frame of the 850-year-old building in the centre of Paris is made from timber from an estimated 1,300 trees used for the construction of its beams. Notre Dame is famed for these incredible timber beams and wooden carvings that characterised the cathedral’s Gothic vaulted ceiling. But the inferno, which raged for around 12 hours, ravaged the wooden structure of the medieval building. The main spire – which was around 750 tonnes of ancient oak lined with lead – collapsed in flames and crashed through the wooden roof. The nature of the cathedral’s timber-framed skeleton means that it will be nearly impossible to rebuilt it in exactly the same way as before. The cathedral contains one of the oldest surviving wood-timber frames in Paris, involving around 52 acres of trees that were cut down in the 12th century. Each beam is made from an individual tree giving the lattice of woodwork that makes up the ceiling its nickname ‘the Forest’. The trees that made up the roof’s wooden structure were cut down in around 1160, and some sources estimate that the beams accounted for 13,000 trees. Today only four per cent of Europe’s remaining woodland is primary forest that have not been touched by human activity. 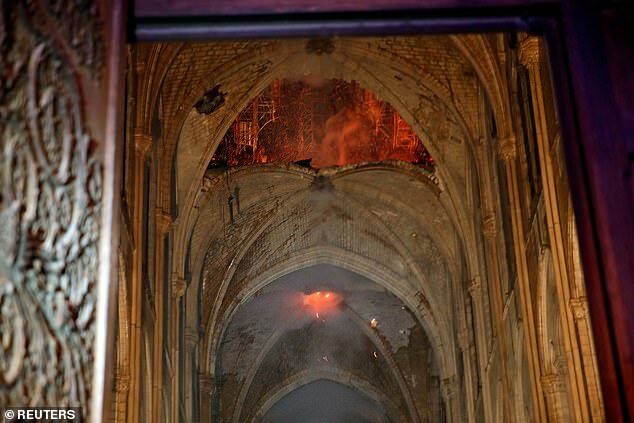 Experts say the combination of a structure that’s more than 850 years old, built with heavy timber construction and soaring open spaces, and lacking sophisticated fire-protection systems led to the quick rise of flames, which jeopardised the entire cathedral before firefighters brought the blaze under control. Once the fire died down it was discovered the golden crucifix and altar of the cathedral were preserved amongst the smouldering rubble. One of the cathedral’s most precious objects, a relic said to be the crown of thorns worn by Jesus Christ on the cross, was also saved along with the Blessed Sacrament and King Louis IX tunic.